Are you new to Programming? Do you have little to 'zero' experience with computer programming? Do you want to quickly learn the basics in Python programming? If your answer is 'yes' to all the above, then this book is for you. It will explain in clear-concise detail the fundamentals of python programming so that you can begin to write your own Python Programs. 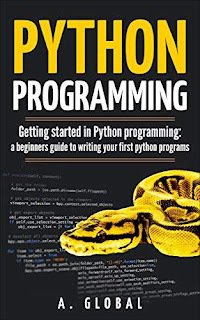 This book also has, has actionable information on how to learn Python programming to a point of knowing how to write your first programs if you are a complete beginner. It will give a gentle introduction into programming with Python, and take you step by step through the basics and fundamentals of coding to give you a sound footing in programming.